Y'all, maybe it's the heat, maybe it's my allergies, maybe it's waking up so early to run (and where's that nap I keep promising myself?! ), but I'm tired. Apologies in advance if this post is more discombobulated than usual. Jeff and Max returned from their canoe trip last Saturday - they had a great time, although Jeff came home with a wrenched back (they were messing around and capsized the canoe in rapids - BOYS!) and spent several mores days at home bugging me on muscle relaxers and pain meds. He's finally gone into work today - hopefully the worst is over now. Kevin with the 28 lb. watermelon. It was mine, all mine!! No, I shared. Just not with Kevin, because he's the weirdo who doesn't like watermelon...I KNOW! Does. not. compute. This little guy was out with his owner. We were all over that puppy! Luckily, his owner didn't mind. Actually, he was outnumbered and didn't really have a choice against two puppy-crazed women. Later on, Cindy and I took some pictures together, and of course Paco had to get in the shot. He was still smelling my arm, where I'd held the puppy earlier. Yes Paco, I cheated on you...and I'd do it again in a heartbeat! I too busy smelling interloper to look at camera. Tomorrow I'll be getting up well before the crack of dawn again to go run 4 or 5 miles with my early morning crazies, and then we'll meet up with the running club. I may not run the extra 2 miles - we'll see...maybe I'll stay behind and cheer everyone in. I will be glad when the running club's long run mileage catches up to where I'm at so I won't have to get up quite so early. Only about 7 weeks to go, ugh. 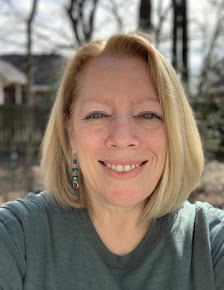 On Sunday, I'll be flying to California to visit my best friend Barbara for a couple of weeks. Not only do we have our usual amount of fun on tap, but since she's going to have to work a few of the days I'll be there, I've made plans with some other friends as well, which should be great fun and filled with adventures! I'm not going to stress over keeping to my regular blogging schedule, so if I have time, you might see a post, and I have a couple of reviews pre-scheduled, but otherwise, things should be back to normal on July 16th. 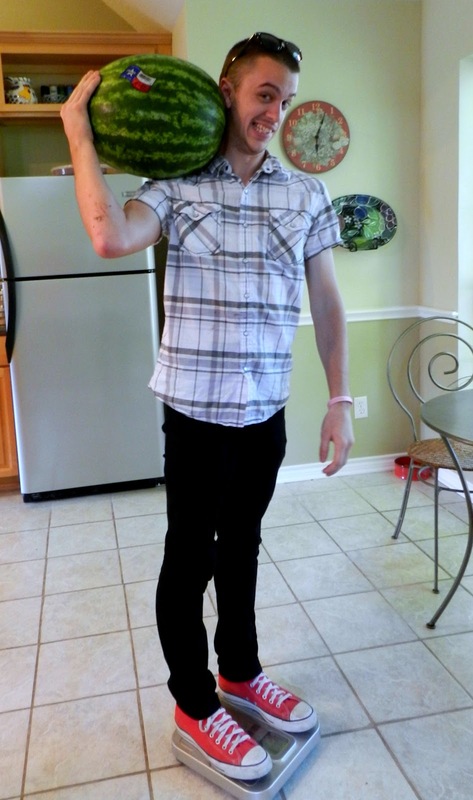 That's a Texas-sized watermelon!! Is it good? Still crappy here, darn it. I think I'll join Keven and just refuse to eat it. Bad watermelon does not help my not liking many fruits cause lol! That puppy is so stinkin' cute. I would have been all over it too. By any chance was the owner young and single? Because that puppy might be the best chick magnet ever. Texas-sized watermelon from Texas - and it is fantastic! I'm sorry you haven't had any good ones - maybe we Texans are keeping them all here? The puppy's owner was pretty good looking, but he said it was his girlfriend's dog. Wonder if she knows he was out picking up cougars with it? HAHAHAHAHA, I can't even say that with a straight face! Have lots of fun with Barbara and your other friends! Don't worry about your blog, you know I'm still here when you come home. Oh my goss the puppy is adorable and so is the squirrel. And yes Paco: you are too! But you got yourself a pretty big one, enjoy it. Have a great time in California. I'm looking forward to hearing all about your wild adventures when you return. Will miss you in the meantime. Thanks, Gigi - I'm so glad you're back to blogging! 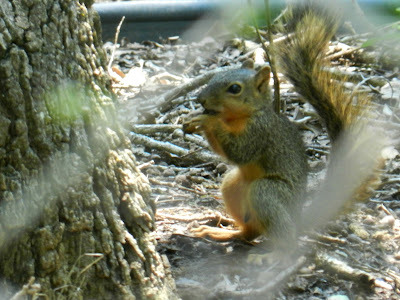 That baby squirrel with the ball is the cutest thing! That melon is huge! I like watermelon, but it is so expensive (at least up here). I get a lot more blueberries for the money and considering how much I eat, it's probably a good thing I don't get the watermelon. Don't stress on the blog. I know we tend to get that way about a scheduled post, but life off the internet is most important, right? Wow, that's unbelievable. Even when they are on sale, blueberries are pretty expensive out here. And watermelon is as cheap as can be! The watermelon was $4.98 - I've gotten them as low as $3.48 this season. Blueberries, like Debby said, are always expensive...same for raspberries and cherries, dang it. 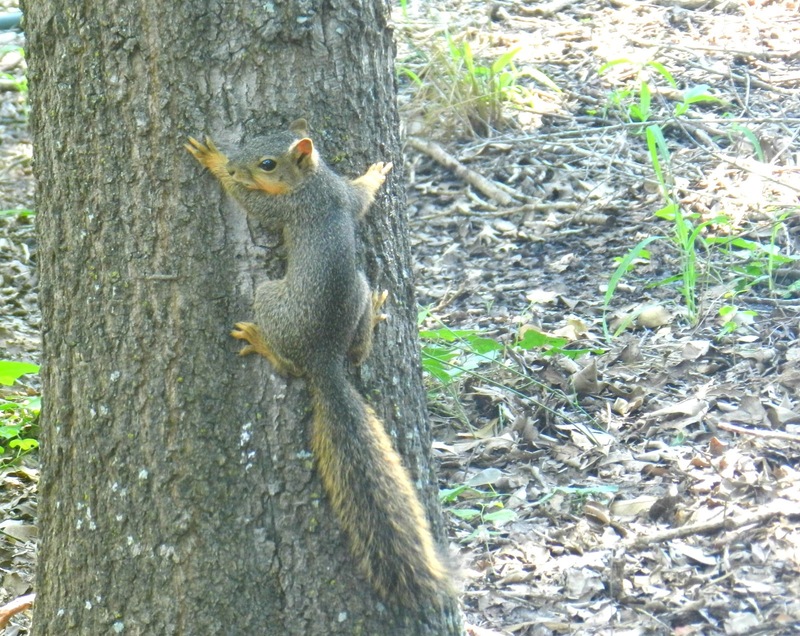 I love squirrels so much! It's crazy. 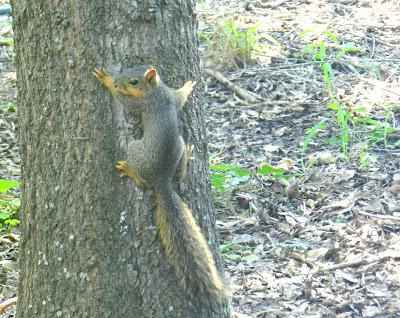 You would be so entertained by my backyard squirrels. They are too much fun! BABY SQUIRREL ROLLING A BALL??? How on earth did you get a picture of that? Glad Jeff is back to earning a living LOL. And especially glad he will be able to take you to the airport! I remember the rain and the grass growing in Texas. Sometimes it got so bad you would have to lift the lawn mower a bit to get it to move forward a few inches. Ack. Paco's picture is too funny. 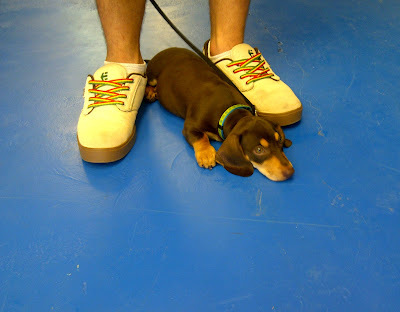 That baby dachshund. Oh man. SO CUTE. Hey - we should go visit the Santa Cruz animal shelter on our day. Wait...that might not be such a good idea. Max WAS having to lift the mower every few feet to get through the grass, and he also raised the wheels as high as he could. I probably should call someone with a riding mower to get through the backyard - there's no easy way to do it now, and Jeff's back is just marginally better. That might mess it up again. That's a huge melon!! I hope you have a great time on vacation! We will miss you Shelley but hope you have a great time! I'll be up pre-dawn for a run too. I love to think about you running "with" me! Somehow it helps! that puppy is toooo cute. Hannah and her boyfriend just got a tiny puppy - its a boston terrier and so fricken cute - my 90 pound dog will never be the lap dog I want him to be! 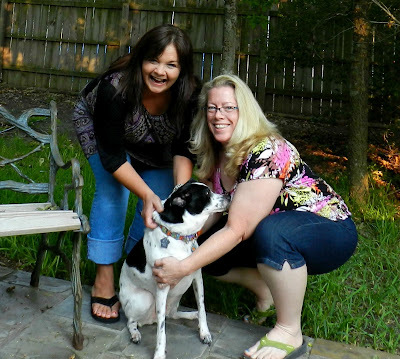 Have so much fun with Barbara - I know these trips are always so fun for you both! Thanks - I'm really looking forward to some Barbara-time. 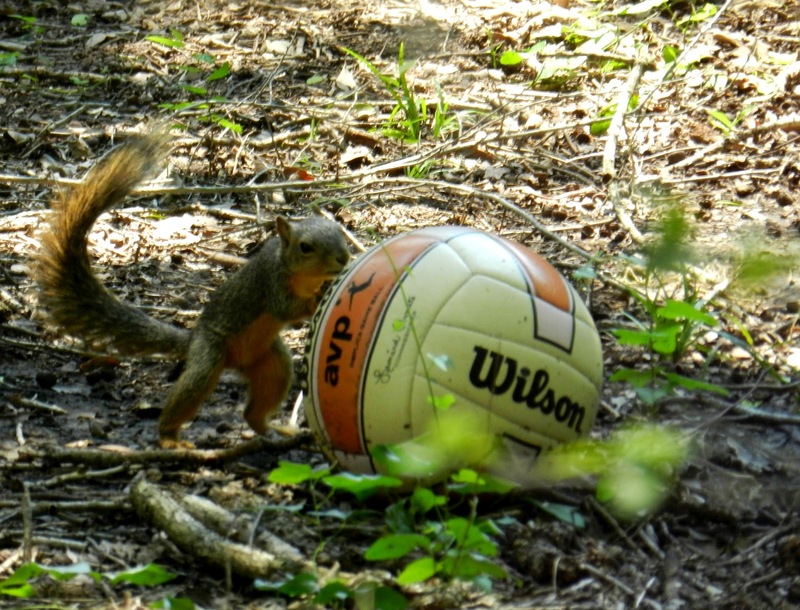 OMG...the squirrel and the ball???? AWESOME shot. 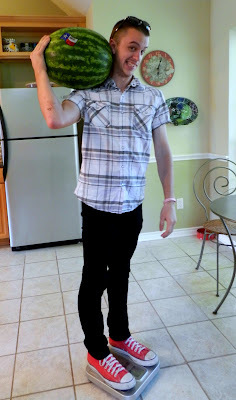 Now, if you can take it's photo rolling a 28 lb watermelon, that would be even MORE hilarious!!! And I "aww'd" out loud at that puppy. Have a FANTASTIC vacation. 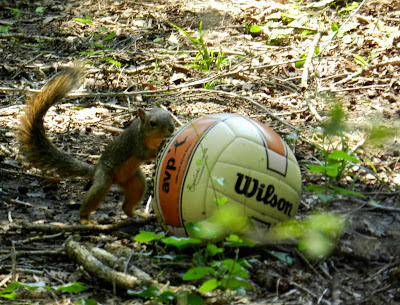 You have very talented squirrels in Texas, ours can't play soccer! Not that I know of. I feel your pain with the early mornings, have to run early before it gets unbearable! Shelly, what is your secret to picking out a sweet watermelon? I've just about given up trying to find a good one...and you even let your son pick one up for you. Please share your secret!! Also, I love your blog! I read somewhere to look for a yellow underside, so I do that, along with trying to find a fairly heavy one, because to me that signifies juicy. Every once in a while I get a mushy watermelon, but I've been pretty lucky this year. Now THAT is what I call a watermelon! One of God's treats for allowing the summer temps to be consistently over 105° right now. Two weeks with your best friend! I'm envious, forgive me. Every time I see a huge a** watermelon, - I think of you! Your grass is so green! It's been drough city in Chicago, my lawn is all brown and gross - but I haven't had to mow it because it hasn't grown! I feel like you'd appreciate the watermelon bowl featured in my latest post - an alcoholic beverage served in half a hollowed watermelon. So delicious.